Keeping your teeth and mouth clean with regular brushing and flossing is essential to good dental health. That’s why we urge all of our patients at La Costa Dental Excellence in Carlsbad to schedule cleanings and checkups every six months. When one of our hygienists cleans your teeth, the aim is to remove plaque, tarter and stains that have accumulated. Even if you’ve been brushing and flossing religiously, chances are you’ve got some build-up. Bacteria naturally occurs in the mouth, and tries to colonize on the smooth surfaces of your teeth. At first, it is soft enough to remove with a fingernail. After 48 hours, it begins to harden. 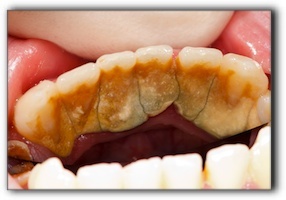 Give it 10 days and it has become tartar (see picture), which is more difficult to remove. This bacteria feeds on sugars, and produces acid that eats away the tissues of the tooth, leading to cavities. Cavities originate on the surface, and spread on and through the tooth. The best way to deal with plaque is to brush and floss regularly. A fabulous smile with fabulous teeth takes some work. So keep them clean, and keep coming in for your twice-yearly cleaning and checkup. Even then, if you aren’t happy with your smile, consider the benefits of cosmetic dentistry. At La Costa Dental Excellence in Carlsbad, your dental health is important to us. Call us to schedule a consultation or appointment. provide restorative and cosmetic dentistry, and also treat sleep apnea.